For a fifth season now, this forum will hold the Free Spirits meta-nonathlon. Most of you reading this will already be aware of how this works. Here's a quick summary or FAQ for the newbies and the forgetful. What is the Free Spirits meta-nonathlon? The meta-nonathlon is based on the nonathlon. I’m assuming anyone reading this, is familiar with the nonathlon. I have no involvement in the nonathlon apart from being a participant myself. I just 'borrow' the scores from that website. 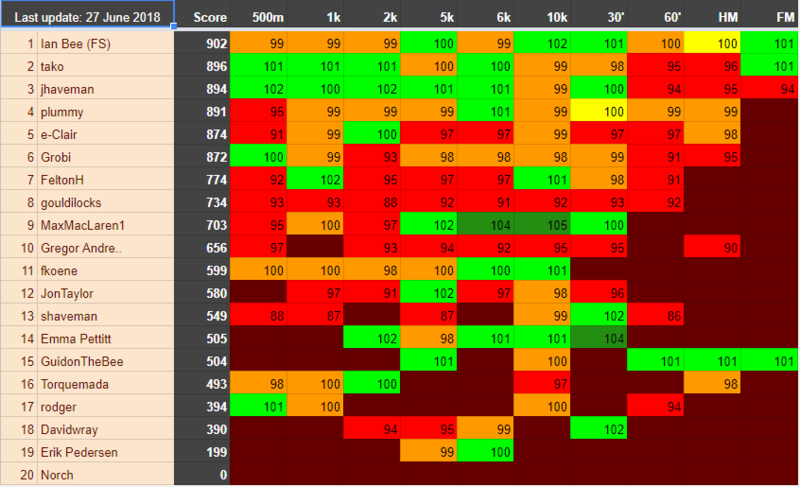 The meta-nonathlon compares your nonathlon scores with those of your previous season. In essence, you are competing against your former self. The scores will then be sorted into a Free Spirits meta-nonathlon ranking that shows who is doing the best job of improving on last year. For every nonathlon distance (500m, 1k, 2k, etc.) and timed piece (30 min, 60 min) your 2019 nonathlon score will be divided by your 2018 score. The outcome is then multiplied by 100, giving a percentage as your score for that distance. So, managing a better score on a piece than in the previous season gives you a score over 100. The scores are rounded off to whole numbers, for easy-view purposes (showing decimals makes the sheet look messy). Just like in the nonathlon itself, the total score is calculated as the sum of the nine best individual scores (out of all 10). There is no bonus for doing all 10 distances. All scores in the table are rounded off. The sum score in the table is the sum of the actual (ie. not rounded off) scores. This means that the sum score you see in the table can be 1 point higher or lower than the score you would get if you added up all the rounded off scores. - Red: over 2.5% worse than last season (large decline). Because scores are rounded off, cells with a score of 100 can be either yellow, orange or light green. What if you didn't row all distances last year? 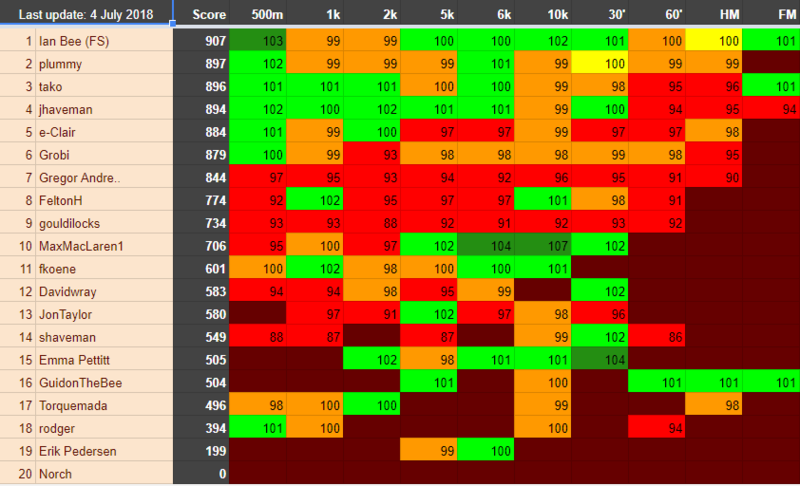 If you haven't entered a time/distance for a piece in the previous season, the score to beat will be equal to your highest score in that previous year. In my case, I didn't do a FM in the 2018 season. If I decide to do one in 2019, the 2018 benchmark is set at 836, which was my highest score of all pieces in 2018 (for my 5k). There is a threshold of 5 ranked pieces though, so If you entered less than 5 nonathlon scores in the previous season, the benchmark for un-entered pieces will be set at 1000 instead of the highest ranked score. What if you weren’t in the nonathlon last year? 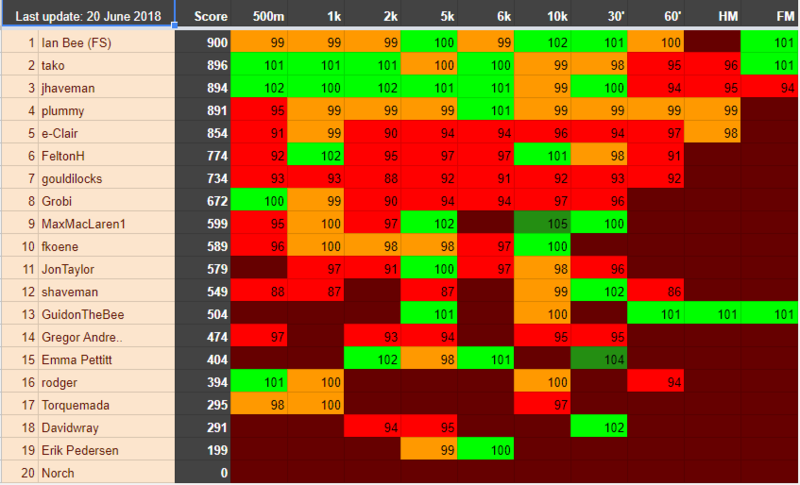 The point of the meta-nonathlon is to compare your current season to your previous, based on nonathlon scores. If you didn’t enter any nonathlon scores last year, there is nothing to compare your current performance with. You will have to wait until next season to find your name in the table (sorry). There is no need to ask me to get included in the meta-nonathlon. If you did the nonathlon last year and Stan has added your name to the Free Spirits filter group on that website this season (you can ask him here), your name will appear in the table. If you took part in the nonathlon last season, but weren’t on the Free Spirits list then, don’t worry: I can grab your 2018 scores from the archives of the nonathlon (providing your user name is the same as last year, if not: let me know). I aim to post a new table in this thread every Wednesday. Out of the 23 Free Spirits that signed up for the nonathlon so far this season, I was able to match 21 to last year's nonathlon scores. Stan (no scores in 2018) and Jill (no nonathlon in 2018) are the exceptions. Yes, thanks indeed Rodger! Nice to see my name up at the top for a change. I'm now regretting putting in a bit of an effort to improve my scores towards the end of last season. Imagine how much better my score would be this season if I hadn't bothered! This is a real motivator and help!! Thanks, Rodger. Good fun and motivation. Last season was a bit of setback for me. Only rowed about 55% as much as the season before, mostly due to travel and illness. So far this season is starting off right. Good luck to everyone. Cheers for doing this again Roger. Last season's nonathlon was a good one for me, fingers crossed this season I'll get close to those scores again. Yes, thanks Roger for this encouragement. For me last season was pretty good as well, I hope this season won't be to disappointing. The meta-nonathlon has a new leader. Normally that could be seen as a somewhat festive occasion. Sadly, this time it's not (no offence Ian). It's because the previous leader has left the team. Best of luck to Paul. Thanks Rodger. Two greens for me - happy about that. 7 extra points for my second best 500m in 6 years last night and bumped Tako into third so I fear I may have kicked a hornet's nest there. If I can find a few more points here and there (not sure where, may a couple on my 5k and 60 mins) it looks like I'll be trading blows with Mr Bee....again!! bumped Tako into third so I fear I may have kicked a hornet's nest there. Cheers Rodger. A nasty full line of redness for me, but at least this means I've done all 9 of the distances I'll be attempting this season. Now to hopefully turn those reds into oranges or better. 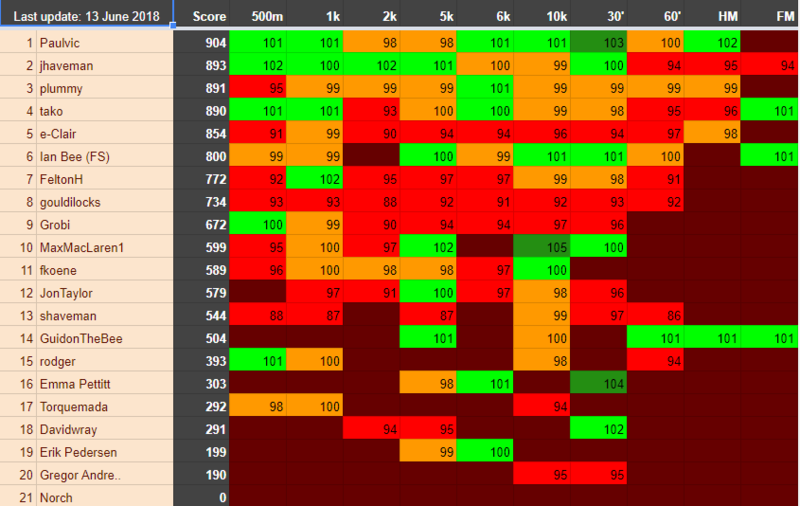 I can't see myself getting a great meta-nonathlon score after last season, but it would be nice to chip away at those scores and improve the colours a wee bit. Yes, thanks Rodger. 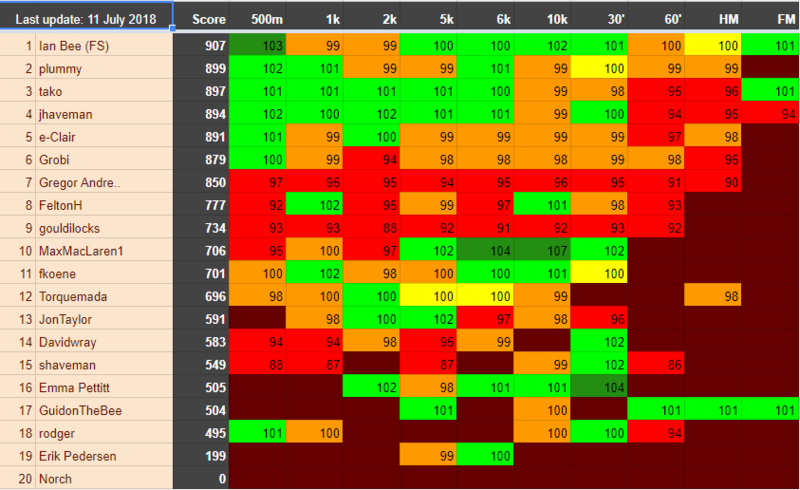 For me there's still some work to do to get things green, but happy to see my score of 701 out of seven distances.